Whilst the heatwave is over, we’ve still got a few weeks of summer ahead of us. Hopefully, the sun will hold out through autumn, meaning we still plenty of time to get out and use your decking for a get-together. To make sure that you get the most out of your decking, protecting it with a well-applied deck stain, ensures that it will last whatever the weather. In this article we’ll be going through the different types of stain you can use, how to apply stain and care for your decking. Semi-solid stains are the next level up, drastically changing the appearance of your decking. Often, they’re used on lighter wood types to make them appear darker. Finally, we have solid stains, which as the name suggests completely changes your deckings appearance. Solid stain is also a much thicker coat sitting on top of your deck like a layer of paint. The type of stain that you opt for will determine the frequency with which you have to maintain it. Transparent stains will typically need to be reapplied every 10 months to a year. Whereas solid stains can last up to 5 or 6 years, if well maintained. Speaking of maintenance, one way in which you can reduce the need for re-application is to apply protective coatings. A UV-rated weatherproofing seal can increase the time between the need for re-application by up to two times. Seals will help to keep your decking safe from adverse weather conditions. How does wood stain become damaged? Many factors contribute to your wood stain becoming worn or fading but the most common is regular use. 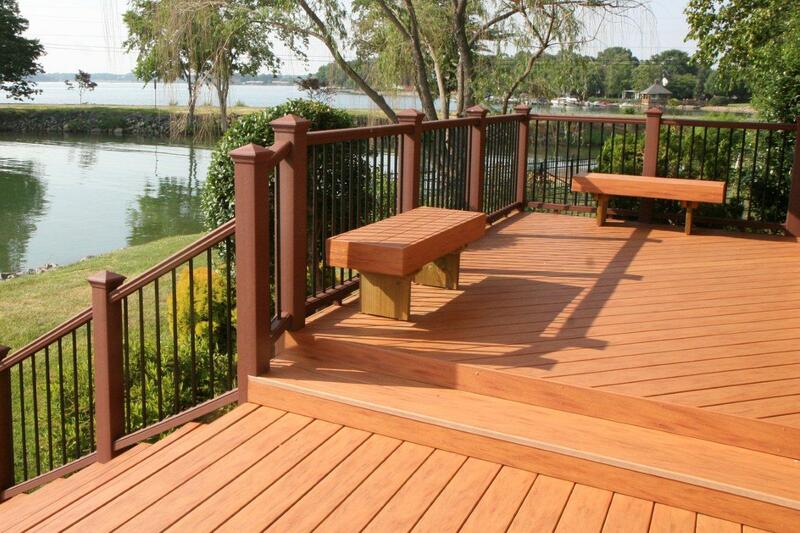 If a deck is well stained, it should last a long time. If you do notice any wear, its likely to be in areas of frequent use. This will likely be, right outside of your door, beneath decking furniture, or around any stairs leading to the rest of your garden. Overly humid climates or excessive rain can cause the stain to fade. This, in turn, can encourage the growth of fungi and mould. Conversely, excessive heat and the sun’s UV rays cause the stain to dry out and crack. Step one when staining a deck should always be to clean it. In next week’s article, we’ll be talking about washing your decking. But in the meantime, a quick brush and rinse should be enough. Make sure that you allow ample time for drying before you begin. Sand your decking to ensure that the stain soaks into the wood better. Check the application instructions for your chosen stain and follow them. The type of stain will often dictate how you need to apply it. Thicker stains, for example, are best applied with rollers and brushes. This provides a more even coat. Transparent stains, however, can be easily applied with a sprayer. Avoid over-applying by using all of the stain you have on your applicator before you add any more. Once you’ve finished, make sure to remove the excess stain before you leave it to dry. Don’t ruin your clothes! Wood stain is very difficult to remove from clothing, so wear something that you don’t mind ruining should you spill anything. To avoid stain collecting at the foot of vertical surfaces such as a railing use a cloth to collect the excess, likewise stain the floor last so that you don’t have to walk on it to get to hard to reach places. Finally, should you need to use more than one bottle of stain, make sure to mix all of your bottles together, so that the colour stays consistent throughout. For more handy DIY tips, follow our blog as well as our Facebook and Twitter. Or for any on the spot advice, you can visit one of our stores. We’d love to hear from you!